Whether you have a day, a week-end, or all the time in the world – check out some of these communities, as you follow the River. The Scenic St. Croix River flows between Minnesota’s eastern border and Wisconsin’s western border, passing attractive river towns with historic architecture, interesting shops, theatre, train excursions, boat cruises and beautiful B&B’s in stately old homes. This 52-mile stretch from Taylors Falls to the St. Croix confluence with the Mississippi at Hastings has everything a visitor could want. Hastings, MN. – This quaint community is located on the bluffs at the confluence of the St. Croix and Mississippi rivers. The City is known for its wonderful Victorian architecture, especially on the historic downtown Main Streets where you will find antique shops, gift and specialty shops and wonderful local cafes’ and restaurants inviting you in. Make sure you stop in the Area Chamber of Commerce and Tourism Bureau pick up a map of Hastings and take advantage of the Historic Walking Tour which highlights more than 60 historic properties around the downtown area. As you meander along the river head toward Lock & Dam #2 for a chance to watch boats and barges as they navigate through the lock system. For history lovers, a visit to the LeDuc Historic Estate is a must. This Gothic Revival mansion was built in the 1860’s and is open for tours May 22 through the end of October. Outdoor enthusiasts will enjoy hiking the trails of Afton State Park or Carpenter Nature Center and be sure to take advantage of excellent bird watching at Great River Road Visitor and Learning center. Afton, MN. – Almost every month of the year, visitors can be seen strolling down the eclectic main street of Afton with its charming shops, historic landmarks and gourmet restaurants and cafes’. Tucked between the St. Croix River on the east and steep Minnesota bluffs on the west, the downtown’s 19th century homes, storefronts and inns seem almost like part of a Mark Twain novel. For a special treat stop at the ice-cream shop for homemade ice cream, have lunch at the Historic Afton House Inn or take time for a river cruise on one of the Afton-Hudson Cruise Lines vessels. Stillwater, MN. – Several miles north of Afton, is the largest city on the St. Croix. It is also one of Minnesota’s oldest towns, founded in 1843, and it’s beautiful, historic architecture now houses an array of antique shops, art galleries, book stores specialty shops, eclectic restaurants, and charming B & B’s. Main Street is a great shopping and dining experience. One of the best ways to see the beautiful old homes and take in the sights of Stillwater is to take a narrated trip aboard the Stillwater Trolley. Marine on St. Croix, MN. – A wonderfully quaint village on the river with architecture dating to the 1800s. Step back in time as you walk through the front door of the You will be amazed at the wonderful variety of merchandise on the shelves. If you can’t find it in the General Store it doesn’t exist or you do Marine General Store. n’t need it. Next to Marine is William O’Brien State Park, where you can rent a canoe or kayak to paddle along the St. Croix. In nearby Scandia, MN, visit the Gammelgarden Museum with its collection of log homes and a church built by Swedish immigrants in the 1850s-1870s. Stop in the Scandia Café for a great cup of coffee or delicious homemade treat. Taylors Falls – A little town of only 976 residents northeast of the Twin Cities. Surrounded by bluffs and high cliffs, the area is a geologist’s dream. There’s evidence of ancient lava flows traces of old river beds. This bodes well for exploring rocks, especially at the state park at the edge of town. Interstate Park along the scenic St. Croix River was jointly founded in 1895 by Minnesota and Wisconsin, which both border the river. To find a few local treasures from the area, hit the charming little shops in the downtown area and make sure to take in the several 1850s Greek revival style homes in the Angel Hill district in Taylors Falls, including the Folsum House, open for tours in summer and fall. Just west of Taylors Falls is Franconia Sculpture Park, and there is no such thing as a quick look – the park is packed with sculptures, and each leads irresistibly to another. How ‘Swede’ It Is – Välkommen history lovers! Swedish history is all around the Chisago Lakes Area so come learn about the great emigration from Sweden and just maybe you will discover your inner Swede. Swedish author, Vilhelm Moberg visited this area and brought the history of the first immigration alive in his novel series ‘The Emigrants’ with fictitious characters, Karl Oskar Nilsson & wife Kristina. Visit the Vilhelm Moberg Sculpture, located in Chisago City. The 1880’s homestead used as a basis for his characters’ home has been restored and stands lakeside in Ki Chi Saga Park. Don’t miss the giant Swedish coffee pot on Hwy 8! Stop by the Chamber & Visitors Center and pick up a Lindstrom Historical Walking Tour. Cuisine from local eateries is sure to satisfy your taste buds. Visit Chisago Lake Lutheran Church in Center City filled with Swedish history and featured in the movie ‘Grumpy Old Men’. The Swedes loved this area and so will you. Beautiful scenery and little bit of Sweden. Tack så mycket. St. Croix Falls, WI. – Head to the town of St. Croix Falls, where “the Grandfather Of Wisconsin Parks” straddles the St. Croix National Scenic Riverway. As Wisconsin’s oldest state park, people have been visiting, Interstate Park, since the early 1900s. Hike the Pothole, Summit Rock or River Bluff trails for the best views of The Dalles of the St. Croix. This steep-sided gorge was created after melted water from the Ice Age sculpted the riverside into uniquely carved bluffs. At the observation deck from Pothole or Summit Rock trails, the view looking southwest is of colorful trees, rock formations and water. Keep an eye out for the “old man” the Old Man of The Dalles, a rock formation carved in the bluffs in the shape of an old man’s face – it’s the Wisconsin version of Mount Rushmore. Osceola, WI. – In a word, Osceola is enchanting. Founded in 1844 and tucked into the spectacular river bluffs the Osceola’s downtown is on the National Register of Historic Places. The quaint shops and restaurants offer a delightful array of goods and cuisine. Just steps away from downtown are trails that will lead you to some of the valley’s natural treasures. Take the stairs to Wilkie Glen for a close-up view of Cascade Falls. Or hike the trail up to the bluff for spectacular views of the river valley. Catch a ride on the excursion train from the Osceola & St. Croix Railway, pulling vintage cars along the river bluffs and across the river through William O’Brien State Park. Hudson, WI. – At Hudson, the St. Croix River broadens and its waters serve as a sparkling backdrop to one of the loveliest towns on the river. Hudson is a center for recreation, with boating, fishing, swimming, golfing, hiking, and biking, as well as a historic site with picturesque Victorian houses and parks. At the center of the town’s historic residential district is the Octagon House, built in 1855 and now a museum. A walk around town is a walk back in time. Stop in the Hudson Area Chamber of Commerce and Tourism Bureau for a map and take the Walking Tour of Historic Downtown Hudson. Enjoy free Concerts in the Park at the Lakefront Band Shell, a wonderful way to spend a warm summer evening, or for outstanding theatre see a production at the Phipps Center for the Arts. Shop the stores of Hudson and experience the many outstanding and electic dining options, galleries, unique shops and boutiques – Discover Hudson! River Falls, WI. – “The City on the Kinni”. Ranked one of the best small cities in the country by Demographics Daily Magazine, River Falls exemplifies the best Wisconsin has to offer with its perfect combination of outdoor activities, arts, cultural events and hometown charm. Stroll historic Main Street and meander in and out of the many specialty shops; take extra time to look for treasures in Riverwalk Art and Antiques. River Falls is home to Wisconsin’s only designated Class 1 Trout Stream, the Kinnickinnic River a treasure enjoyed by fly-fishing enthusiasts from across the country. The “Kinni” is also a favorite of kayak adventurers who traverse through towering canyons and serene landscapes. Visit Glen Park famous for its suspension bridge and the perfect starting point for miles of trails for hikers and bikers. Prescott, WI. – Welcome to Prescott, located at the confluence of the St. Croix and Mississippi rivers; two of our nation’s greatest treasures. Prescott is also the northern gateway to Wisconsin’s Great River Road, one of America’s Scenic Byways. Shopping in the downtown district of Prescott offers many choices. Unique shops mix with restaurants offering casual dining, home cooking and fine dining. A picnic area along the river offers the chance to enjoy the sights and sounds of trains, boats, barges, ducks and geese. Look up and you may see a bald eagle flying overhead! Water recreation abounds. A public dock, sponsored by the City of Prescott, offers easy access to downtown. The public boat launch has adjacent parking for vehicles with trailers. 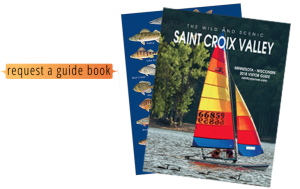 Outdoor enthusiasts will enjoy boating and canoeing on the St. Croix River going north to Afton, Hudson and Stillwater. Year-round beauty is guaranteed; however, it has been said you must experience the peak of its show in fall when the trees become brilliant with color; the apples of the valley ripen and majestic winter descends on the St. Croix River Valley. Visit Prescott! You’ll discover beautiful scenery, lovely people and interesting things to see and do. It’s a little bit of God’s country!